Creating a sculpture in the form of spirals relates to many aspects of life. Through the movement of air and water, inside and outside the human body, rivers are the lifeblood of the Earth as is the blood that pulses through our arteries. Ecological life is restored through increased flow of spirals and vortexes. Water and rivers purify, refresh and revive, heal and strengthen. Water is a mediator between contrasts. Rocks are smoothed down to sand and silt, developing opportunities for other forms of life. The water is becoming alive again now that the San Clemente Dam and Chinese Dam are no longer there. The river is healing itself downstream with pulsating flows and floods of sediment, rocks, leaf litter, logs, all providing the necessary habitat for the Carmel River steelhead trout, lamprey, California redlegged frog (state amphibian), birds, reptiles, salamanders, turtles and all the macro-invertebrates they feed upon. people learning, understanding, and acting upon what the river needs to support all life. Transforming metal from the 106’ tall dam that once held the river back highlights the historic opportunity to inspire generations about the value and power of free-flowing rivers and the flora and fauna that depend on their health. There is no book like this of this beautiful watershed so many depend on. 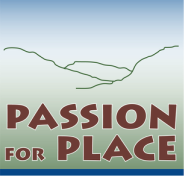 Many thanks to Applied Solar Energy/Solex for purchasing fifty copies of Passion for Place to give to their clients! ​Your business could be next to give this award-winning book to another fifty people! Help spread the message. Passion for Place is a testament to the power one river and its watershed has to capture the importance of nature in cultivating the soul of humanity. It celebrates an insightful vision of what could be for the future of all watersheds of the Earth. rivers and oceans. It is the only book of its kind about the Carmel River Watershed. How do we live what we care about? Passion for Place is a book that shares about that living. by the Jenkins Publishing Group. WE ARE WATER Holistic Retreat at Hastings Natural History Reserve was a great success! It was mentioned in the Thursday April 13, 2014 edition of the NY Times!!! Home and Garden section. Click here to read article. One aspect that sets Passion for Place apart from other nature anthologies is that it follows the river from the top of the watershed out to the ocean. By the time one has read the book, one has gained an awareness of the watershed as a whole through all the voices that make up the book and CD. As one enthusiastic supporter has said, "Everyone should have a copy!" Passion for Place Ambassador Network! Share Passion for Place and its message with friends, family, a school, libraries, or your business clients...buy twenty copies and you will receive a print of your choice of one of my paintings. for the 17th Annual IPPY awards. Seventy five books were considered in the West/Pacific Region category. Congratulations and many thanks to all writers and interviewees and donors and supporters for making this book what it is...A WINNER! Below is an interview conducted at the IPPY awards event. humanity of conscience and attentiveness. the significance of poetry and the arts and conservation. This book and CD is made possible with the financial generosity of 147 people from the community and from around the world, in addition to those who have bought my paintings to support this particular project. I thank Pam Krone-Davis, Marilee Childs, Mary Gale, Skip Kadish, and Steve Zmak of the RisingLeaf Watershed Arts board for making the $5,000 challenge grant possible which gave the project a big boost in the beginning of its steep fundraising goal. Thank you to Ty Griffin for offering and printing free-of-charge the cards that were given to those who pledged at the $50 level on Kickstarter. Thank you to the organizations* for their financial donations and to the Carmel Valley Forum for their 501(c)3 support aiding in raising funds after the Kickstarter campaign. All website content © 2012 to present, Passion for Place, except for above video. Passion for Place designed by Paola Berthoin.